CD Jukebox - the Classic Wurlitzer! 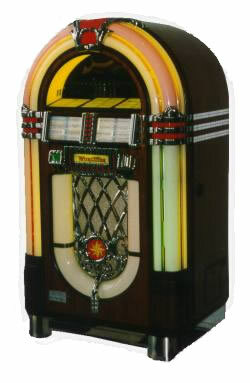 Are you after that retro and nostalgic look with your jukebox? The Wurlitzer 1015 is the one for you. 70 CD's/approx 1,400 songs with the option of you choosing 20 CDs from our CD Catalogue which is available on our web site. Mixed program of 50 CDs already in the jukebox - 50's/60's, 70's & 80's and 90's - all classic party hits plus your 20CD choices. You can see the CD play on this classic jukebox. Comes with 2 X 300 Watt Speakers to give your party quality sound! A fantastic jukebox that would suit any occasion, particularly the "oldies". A real touch of nostalgia! Very popular for weddings, 40ths, 50ths, 60ths and when you want to impress!